The Kegco K9G-CASK Firkin Keg is made entirely of food/beverage grade AISI 304 stainless steel and can hold up to 10.8 US Gallons of beer. The keystone bung and shive bung openings on these casks are lined with anti-slip grooves to help hold the bungs in place. All seams have been TIG machine welded for smooth and consistent seams with no burn residue, making them resistant to contamination. They have fully rolled top and bottom stainless steel chimes for maximum protection against heavy impact and the potential for buckling. All surfaces of the keg have been pickled (chemically descaled) and fully passivated for a clean, sanitary, and corrosive free surface that ensures high quality packaging and transportation of beer and liquids. Used by breweries all over the world, these kegs are an excellent edition to your professional brewery operation, allowing you to offer an unpasteurized and naturally carbonated option to your lineup for special events and tastings. Quantity Discounts are available. Please call 1-800-710-9939 for details. Please Note:In order to tap a cask keg, you would need a keystone, a shive, a hard spile, a soft spile, and a spigot or turndown spout. The bungs can be plastic or wood but we find that wood bungs create a better seal with less leaks. We have the components you need to dispense from this cask. Scroll down to see some available options. Comments: WE have only used them a couple of times, but these firkins have been great so far. They seem to be well made and easy to use. 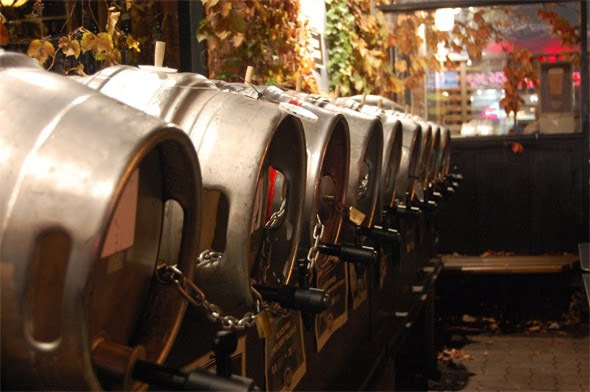 The Firkin actually dates back to the mid-15th century as an ale vessel. It is a 10.8 Gallon cask keg which can hold and dispense about 86 16-ounce glasses of unpasteurized, naturally carbonated beer. The word firkin is based on the Middle Dutch word vierdekijn, which means "fourth". Historically, cask beer differs from standard keg beer because it is naturally carbonated inside the keg through the use of active yeast, as opposed to being injected with carbon dioxide and pressurized. The secondary fermentation gives it more developed flavors than standard draft beer and it has a smoother finish due to the lack of force carbonation. Instead of pushing the beer through a dispense system with the use of CO2, cask beer is pulled out of the keg using a pump called a beer engine. Cask-conditioned ales are stored and served at a slightly warmer temperature than regular carbonated beers to allow for the yeast to stay active and keep the beer carbonated. Keeping the kegs between 50-55°F allows more of the delicate flavors developed during the secondary fermentation process to be tasted. This is the traditional English pub serving technique. Cask kegs are best enjoyed over a day or two and are not intended for long term storage. They are ideal for local tastings and popular cask nights where they are expected to be emptied in one evening.